But, the reality is that you don’t have to embrace these stinks, when you can eliminate them with Febreze and be guest ready all season long. Whether it’s 11 guests using one bathroom, eight uncles belching after a big meal or two innocent poop bombs from your cat, and one silent fart from your Cocker Spaniel, if you have odor problems you need to try Febreze limited edition holiday product line. 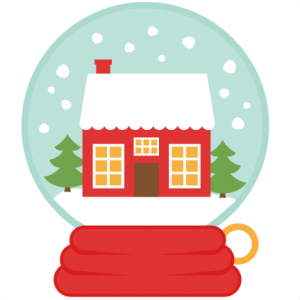 Are you prepping the house for holiday guests? Here are some tips to make a fabulous first "smell impression"! 1. Use Febreeze NOTICEables Jolly Pine to bring the sparkling freshness of a wintry forest indoors. Put it near the front door in order to make that first “smell impression”. 2. Add a little extra cheer to your holiday festivities and spray your couch and curtains with Febreze Fabric Refresher in Cranberry Cheer. Your party guests will sniff and smile when you serve up this tartly sweet, odor-eliminating cocktail. 3. To eliminate the lingering smells of dirty dishes and casseroles. 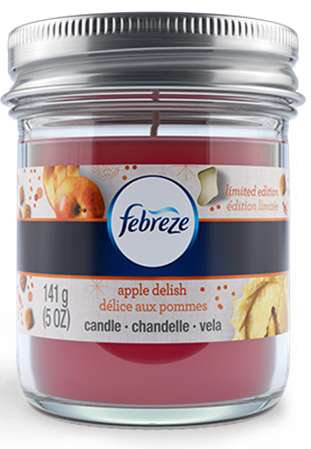 Turn the oven off, and get your Apple Delish Febreze Candle on. Fill your home with the aroma of fresh-baked green apples and berries… and forget about every other holiday baking disaster that’s ever occurred. A Febreze Candle is perfect for small spaces, and looks fabulous on any mantle or countertop. 4. To add an instant burst of freshness and avoid an embarrassing bathroom stink bomb, place a Febreze Air Freshers bottle near the sink. You can choose between Jolly Pine, Apple Delish, Cranberry Cheer, and Pumpkin Bliss. 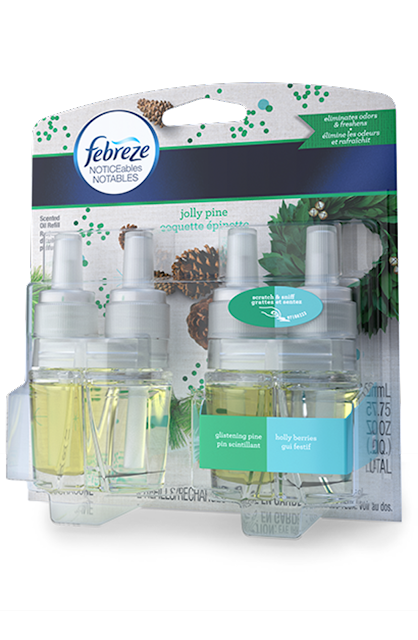 Febreze Air Freshers are perfect to use in your kitchen, bathroom, living room, that storage shed out back… anywhere odors are lingering in the air. 5. 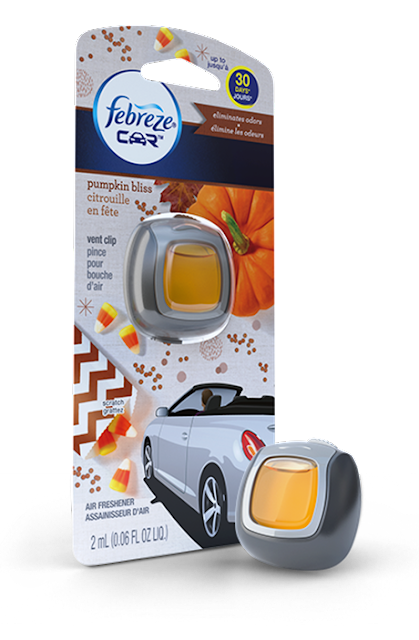 Ease road trips with a Febreze car vent clip to remove odors (sweaty stinky passengers? we all have them) and leaves behind a festive holiday scent. Febreze can turn anyone into the host-with-the-most by removing countless odors in the home with festive product offerings like: Air Effects (Jolly Pine and Cranberry Cheer), Car Vent Clips (Jolly Pine and Cranberry Cheer) and Fabric Refresher (Cranberry Cheer). 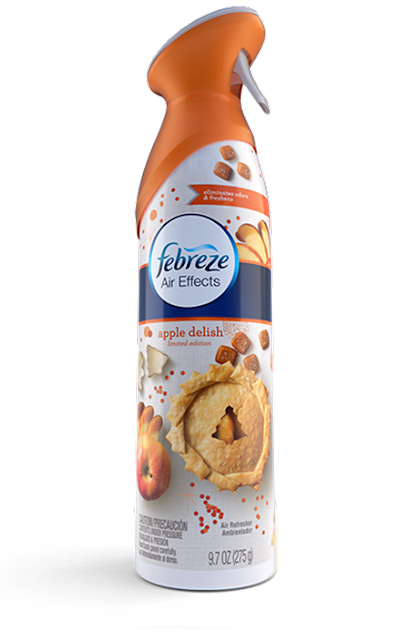 Because Febreze contains proprietary malodor elimination technologies, its products have the ability to truly eliminate odors and replace them with a light, fresh holiday scent. 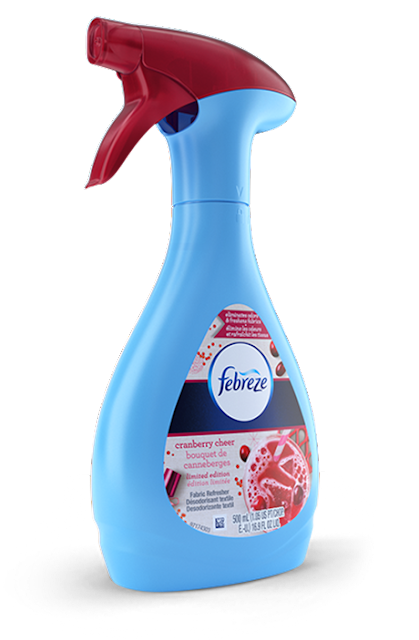 For more information about Febreze products, please visit Febreze.com. 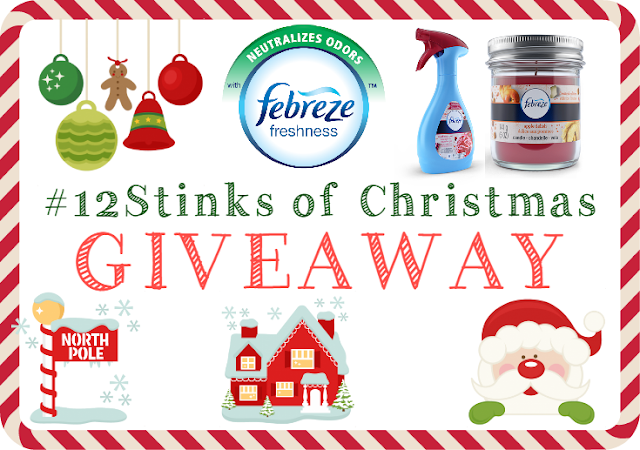 Want to win a Febreze kit like the one below? Leave us a comment and register your entry on our giveaway widget.